Cellulose Fiber Market size was over USD 17.5 billion in 2015 and is anticipated to witness gains by a CAGR more than 9.0%. The cellulose fiber industry will be primarily driven by growing global textile and apparel demand encouraged by high disposable income and increasing purchase parity coupled with growing population, regularly changing fashion trend, and enhanced textile quality without any notable rise in the price. Artificially manufactured fibers find extensive application in textile and apparel manufacturing. GDP development in the emerging regions of China, India, Brazil, and African countries has led to a dynamic lifestyle followed by upgraded consumerism by the manufacturers to capture cellulose fiber market. Global apparel market was estimated at more than USD 1 trillion in 2015 and is projected to flourish with rising demand in the forecast period. High number of manufacturers in the demanding regions will likely have a positive influence on the global cellulose fiber market. Abundant raw material availability, majorly constituting of dissolving pulp from sources including jute, cotton, bamboo, and various others, will also boost the global cellulose fiber market in the upcoming years. Dissolving pulp has vast amount of cellulose content and finds extensive use in cellulose fiber market production. Cotton, for instance, has close to 90% cellulose and jute has around 60% cellulose content. Global dissolving pulp production capacity was more than 7 million tons in 2015, with China producing close to 20% of the global share. Presence of numerous pulp manufacturers provides a competitive pricing, hence optimizing the production cost of cellulose fibers. Environmental benefits over alternative textile fibers such as polyester or nylon will also have catalytic effect on the cellulose fiber market in the next few years. These products are manufactured from plant based raw materials such as pulp obtained from bark, leaves, woods, etc. unlike the petrochemical based nylon alternatives. Hence, they are biodegradable and ecofriendly in nature, providing them a competitive edge over other alternatives. Strict regulations regarding volatile organic compounds (VOCs) are also expected to favor the growth of global cellulose fiber market size in the forecast period. However, growth in cellulose fiber market may be hindered due to the forestry regulations and norms regarding deforestation for wood pulp. Wood pulp price fluctuations because of strict laws in North America and Europe is gradually shifting the focus of global pulp industry towards Asia Pacific and Africa. Also, government initiatives to safeguard the natural forests by controlling the forest productivity and wood output may restrain the availability of wood pulp for manufacturing in the next eight years. 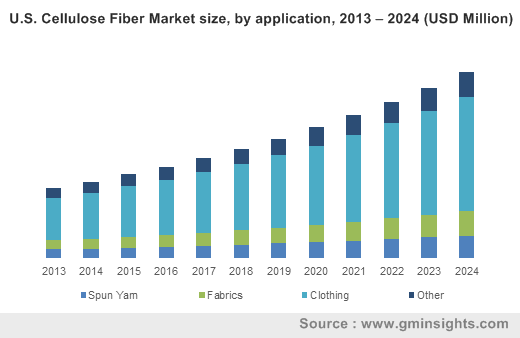 Cellulose fiber market applications include clothing, spun yarn, and fabrics. Rising fashion awareness and higher disposable income will enhance the global clothing and apparel industry in the forecast period. Increasing substitution of nylon and polyester fibers due to lower cost, lighter weight and recyclability will boost the global cellulose fiber market demand in clothing and apparels. Clothing accounted for more than 60% of the global cellulose fiber market share, recording a revenue over USD 10.5 billion in 2015. It is also anticipated to be the fastest growing segment with CAGR above 9.5% up to 2024 on the account of growing clothing and apparel demand. Spun yarn, manufactured by twisting loose cellulose fiber strands, accounted for over 13% of the global cellulose fiber market share, registering revenue more than USD 2 billion in 2015. These yarns find extensive application in high performance tires and tire cords due to their superior properties over polyester fibers. Asia Pacific accounted for a significant chunk of the global cellulose fiber market share, close to 40%, recording a revenue over USD 7 billion in 2015. Presence of numerous textile and apparel industries in China, India, and South East Asian countries is anticipated to boost the overall product demand. Strong production trend of raw materials such as cotton, jute and bamboo in China and India will also have a positive effect on the global cellulose fiber market. It is also projected to be the fastest growing region with CAGR beyond 9.5%. Middle East and Africa (MEA) is expected to have high growth because of shifting of textile industries in several African countries. Cost efficient labor force along with abundant resources in the area will boost cellulose fiber demand in the forecast period. MEA cellulose fiber market is likely to grow from over USD 1.5 billion in 2015 to close to USD 3.5 billion in 2024 by CAGR over 9.0%. Global cellulose fiber market is moderately fragmented with the top six manufacturers accounting to more than half of the overall share. Some companies have multiple roles in the product value chain and participate in manufacturing chemicals for processing, producing the fibers, as well as in manufacturing consumer products such as fabrics, yarns, and textiles. Pulps derived from plants such as cotton, jute, bamboo, hemp, flax, etc. are chemically processed to manufacture these fibers, with principal application in the manufacturing of textiles and clothing. Few fibers also find application in tire manufacturing for their enhanced mechanical properties. Increasing apparel demand owing to rising income and enhancing lifestyle dynamics will aid the market growth in the upcoming years. Cost effectiveness coupled with light weight and skin friendly quality will also have a positive influence on the global cellulose fiber market.